1Faculty of Applied Sciences and Biotechnology, Shoolini University, Post Box No. 9, Head Post Office, Solan, Himachal Pradesh, INDIA. 2Department of Biotechnology, Chandigarh Group of Colleges, Landran, Mohali, Punjab, INDIA. 3Department of Food Science and Nutrition, University of Minnesota-Twin Cities, St. Paul, MN, USA. 4Microbial and Plant Genome Institute, University of Minnesota-Twin Cities, St. Paul, MN, USA. 5Biotechnology Institute, University of Minnesota-Twin Cities, St. Paul, MN, USA. Background: Terminalia bellerica belonging to family combretaceae is one of the major components of “Triphala”, an Ayurvedic formulation. 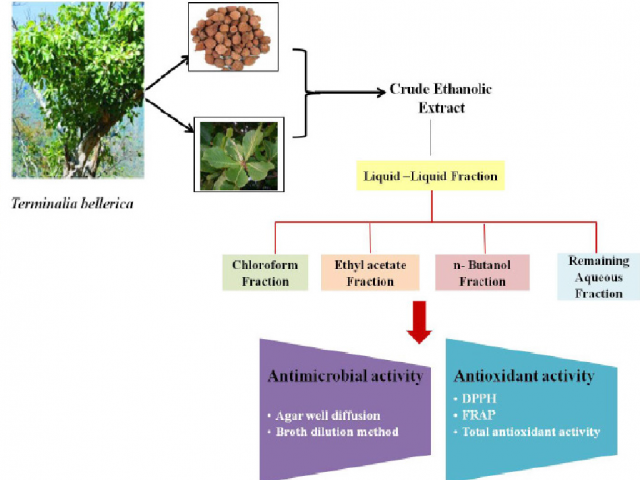 Objective: To evaluate antioxidant potential in the ethanolic extract and its active fraction (chloroform, ethyl acetate, n- butanol and aqueous fraction) from fruits and leaves of Terminalia bellerica. Materials and Methods: Folin-Ciocalteau method and aluminium chloride method was used to quantify total phenolic and flavonoid content respectively in ethanolic extract and their fractions from fruits and leaves of T. bellerica. The antioxidant activity was evaluated using total antioxidant activity, DPPH, FRAP and total antioxidant activity methods. Results: Total phenolics (254.72±3.03 mg/g GAE and 227.52±1.38 mg/g GAE) and flavonoids (64.77±1.24 mg/gm RE and 75.57±1.38 mg/gm RE) content was higher in ethyl acetate fraction of both fruits and leaves sample of T. bellerica, respectively. The order of free radical scavenging activities was ethyl acetate fraction > crude ethanolic extract > n-butanol fraction > chloroform fraction > aqueous fraction. Similarly, ethyl acetate fraction of both fruits and leaves exhibited more antimicrobial activity as compared to that of ethanolic extract as revealed from agar well diffusion method with diameter of zone of inhibi¬tion of 14.0±1.41 mm, 21.0±1.41 mm, 14.0±1.41 mm, 14.5±0.71 mm in fruits and 18.0±1.41 mm, 22.5±2.12 mm, 15.5±2.12 mm, 14.5±3.53 mm in leaves against B. subtilis, S. aureus, E. coli, K. pneumoniae, respectively. MIC values for fruits were 3.125 mg/ml, 0.375 mg/ml, 3.125 mg/ml, 3.125 mg/ml and for leaves were 1.5625 mg/ml, 0.19 mg/ml, 0.78 mg/ ml, 0.78 mg/ml against B. subtilis, S. aureus, E. coli, K. pneumoniae, respectively. Conclusion: The present study provides the evidence for comparative antioxidant and antibacterial potential of ethanolic extracts of fruits and leaves of T. bellerica. . Moreover, leaves can be promoted to be used for therapeutics and natural antioxidants. Chandel SR, Kumar V, Guleria S, Sharma N, Sourirajan A, Khosla PK, et al. Sequential Fractionation by Organic Solvents Enhances the Antioxidant and Antibacterial Activity of Ethanolic Extracts of Fruits and Leaves of Terminalia bellerica from North Western Himalayas, India. Pharmacognosy Journal. 2019;11(1):94-101.